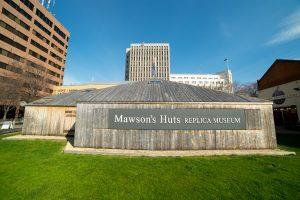 Mawson’s Hut Replica is a small, true to life museum which duplicates the historic huts used by the team of 18 courageous men who went on the Australian Antarctic Expedition (AAE) of 1911-14 and lived in Cape Denison, Commonwealth Bay. In this challenging environment, these men made themselves at home and braved the unforgiving gusts of wind in this far eastern sector of the Australian Antarctic Territory, some 3000 km south of Hobart. Led by geologist and explorer Sir Douglas Mawson, AAE was unique in the Heroic Era of Antarctic exploration in that it was organised, supported, and funded primarily by Australians. This was an epic achievement for a country that was just over a decade old at the time. Image thanks to Dale Baldwin. The replica was constructed by heritage architects and builders. All profits go towards the Mawson’s Hut Foundation, whose mission is to conserve the original huts in Antarctica, which are still standing today. It was opened in 2013 on the 102nd anniversary of the departure from Hobart. 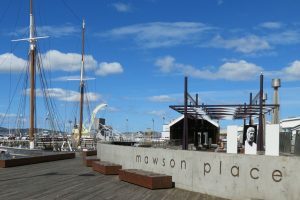 The museum is centrally located on the waterfront in Hobart, opposite Constitution Dock on the corner of Morrison and Argyle Streets. Adult and children tickets available. Special group rates and showings are available upon request. It is open daily and closed on Good Friday, Christmas Day, and Anzac Day. Very little was known about this largely unexplored region of the world when Dr. Douglas Mawson made it his focus and mission to head on this expedition. Some key objectives included: to investigate the region, conduct scientific studies (including magnetic charting for navigational purposes), to identify new species, and explore the geological connection of Australia and Antarctica. Exploration of Macquarie Island, 1500 km south-southeast of Tasmania, was also a goal and the site where a scientific base and wireless relay station was built. This represented the first use of radio on the Antarctic continent and was a major scientific achievement for its time. The historic site consists of four huts and other historical remains. The Main Hut combined two expedition buildings into one. Just 7.3m square, it provided shelter for the 18 men and including space for sleeping, dining, laundry, and darkroom facilities. The adjoining hut served as a workshop and included wireless equipment and a generator, as well as other necessities. Natural lighting came through skylights. A 1.5m verandah surrounded the hut on three sides which served other purposes, including housing the sled dogs. The magnetograph hut is still intact to this day and was used to measure variations in the south magnetic pole. It is located approximately 310m northeast of the Main Hut. The absolute magnetic hut is located about 52m south of the Magnetograph House and was used to collect measurements of the Earth’s magnetic field. It is now considered a standing ruin, having lost its roof and being ice filled. The transit hut was originally known as the Astronomical Observatory and contained instruments which took star sights and determined the exact coordinates of Cape Denison. It is in poor condition and considered a standing ruin. The Memorial Cross was erected in November 1913 in memory of Belgrave Ninnis and Xavier Mertz, two AAE members who perished on a difficult sledging journey during the expedition. The original plaque was returned to Australia for conservation. 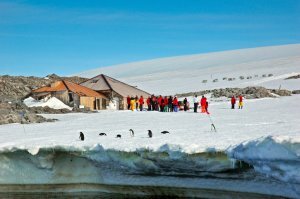 The site is recognised under the Antarctic Treaty as a Historic Site & Monument, and placed within an Antarctic Specially Protected Area and an Antarctic Specially Managed Area. It is also on the Australian National Heritage List and the Commonwealth Heritage List.